The very nature of Rear Wheel Drive shifts the Equus closer to a more ideal 50/50 front-to-rear weight distribution. This means the engine, transmission, driveshaft and rear differential provide better dynamic balance. The larger rear tires and suspension take on their fair share of the workload, offering a smoother, more stable ride and enhanced handling and traction. Hyundai engineers designed this high-performance transmission with precise gear ratios and lightweight components to make it highly responsive and a perfect complement to the Tau® 429-hp V8. The Equus also features an Overdrive Lock-up Torque Converter for higher efficiency at freeway speeds. The high-pressure die-cast engine block is entirely aluminum. A Tuned Intake System (TIS) maximizes power, while Dual Continuously Variable Valve Timing (D-CVVT) improves both low-end torque and high-end horsepower. Further details like the timing chain drive system, serpentine belt and iridium double-tipped spark plugs help make the Equus more efficient. Much more sophisticated than typical shocks, CDC is an electronic damping system that noticeably improves ride comfort and overall driving dynamics at the same time. Sensors monitor values for body, wheel, and lateral acceleration, then use them to generate the ideal damping forces for each wheel on a continuous basis. This minimizes body roll and makes acceleration and deceleration stable, steady and smooth. Like a more high-performance feel? Select Sport mode for firmer damping and a more responsive ride. Stylish LED turn-signal indicators frame the front High Intensity Discharge (HID) headlights. The Adaptive Front Lighting System (AFLS) turns with the vehicle’s steering angle so that upcoming curves and intersections receive illumination. 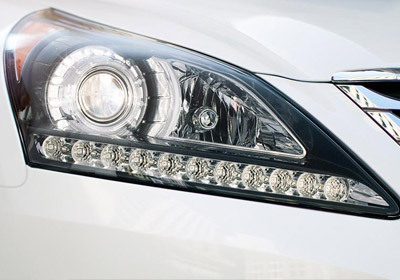 The sophisticated auto-leveling headlights also keep light parallel to the road surface regardless of vehicle load. The result is that the driver enjoys light coverage at all times. Equus features lighting accents to highlight the exterior design and deliver a sense of premium quality and functionality. At the front, LED fog lights help you maintain a clear view of the road ahead. 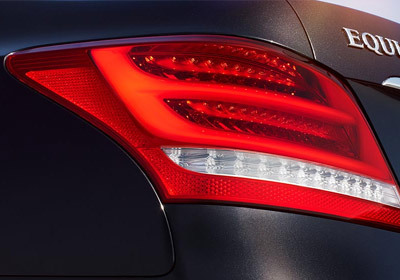 The LED tail lights make those behind you aware of your position and progress. A Vision That Stirs The Senses. The Equus engineers had the enviable task of setting a new design standard for an entire line of vehicles. Starting with the distinctive front grille, deliberate lines continue from the hood through the body to show off the staggered-width 19-inch multi-spoke wheels. HID headlights with LED turn-signal indicators, sculpted front LED fog lights and the distinctive air intake further set the Equus apart in a field of conventional rivals. Cutting out the sun or prying eyes has never been so easy and stylish. Rear side-window sunshades that operate smoothly and quietly at the touch of a button are standard on the Ultimate. Never miss a thing. With Heads-up Display, your vehicle’s most crucial information is conveniently projected directly onto the surface of the windshield. The Equus Ultimate features advanced capability in heads-up mode and information items can be turned on or off at the driver’s discretion. Monitor vehicle speed, turn-by-turn navigation, Lane Departure Warning (LDW), Blind Spot Detection (BSD) and Smart Cruise Control (SCC)—in real time, and never take your eyes off of the road. The power tilt-and-telescopic steering wheel with Integrated Memory System (IMS) remembers each nuance of your and another driver’s preferences. Trimmed in premium wood, the leather-wrapped steering wheel is heated for those chilly mornings, and the entire steering column automatically moves in and out of the way to make getting in and out of the driver seat even easier. Imagine a car so convenient that it can sense your presence and open its trunk automatically so that you can load it easier. The Equus is available with a hands-free smart trunk that will automatically open when you stand within 3 feet behind the vehicle with your key for more than three seconds. Imagine a car so ingenious that it can tell you when it needs care or call for help instantly in the event of an accident. Well, that car is an Equus with Blue Link® Connected Care. It can even send you a Monthly Vehicle Health Report on your car via email. And best of all, Blue Link® Connected Care is complimentary, at no additional charge, for the first year as a trial (enrollment required). Starting with 17 speakers standard, the Lexicon 7.1 Discrete Surround Sound Audio System includes a 13-channel digital amplifier that produces 598 watts. The audio experience delivers higher highs, lower lows and rich mid-range for audiophile-level quality. It also has SiriusXM Satellite Radio with over 170 digital channels, HD Radio™ technology, and iPod®/USB and auxiliary input jacks. Lane Departure Warning is designed to alert drivers of unintended lane changes. Audible, visual and haptic warnings are triggered to restore the driver's attention in cases where the car drifts or changes lanes without using a turn signal. By reducing wheelspin in various adverse traction conditions, including inclement weather, Traction Control gives more stable and predictable acceleration characteristics for a more confident, controlled driving experience. 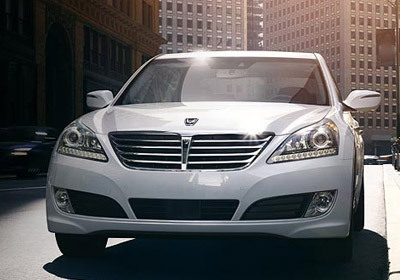 An advanced steel unibody with energy-dispersing crumple zones forms the core of the Equus passive-safety system. The reinforced steel frame enhances safety and handling by creating a more rigid and lightweight body structure. Crash-durable adhesives in critical areas increase dynamic torsional rigidity, enabling better ride and handling.